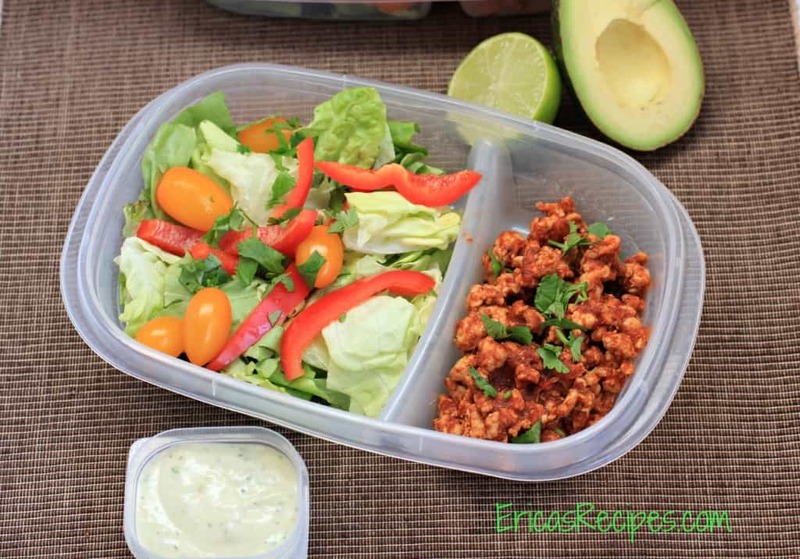 Keep meal-prep easy and healthy eating for lunch during the workweek ready-to-do with my Taco Salad with Avocado Herb Dressing. 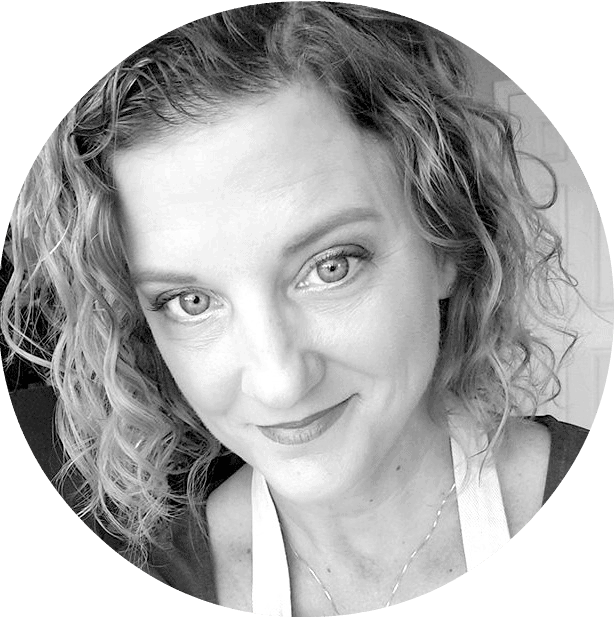 This fifth installment of my Healthy Week Lunch Series focuses on protein and healthy fat. Only three weeks to the half marathon, so I’m still very carb-focused, but I’m getting those from fruit and grains in my other meals and snacks. I just wanted to be eating this salad this week. And no, this isn’t the most inventive dish but, for me, it is all about the dressing. It is so refreshing, and when I use it I don’t miss cheese or sour cream at all. I’m so excited I’ll be eating this this week! With this recipe be sure to look for ground chicken or turkey breast meat, because there’s a big difference in fat and calories between chicken breast and just ground chicken meat. In a large nonstick skillet, cook the ground chicken until no longer pink, breaking up the meat as it cooks. Add the taco seasoning, tomato sauce, and water. Simmer gently for 10 minutes to combine flavors and thicken it up. Cool. 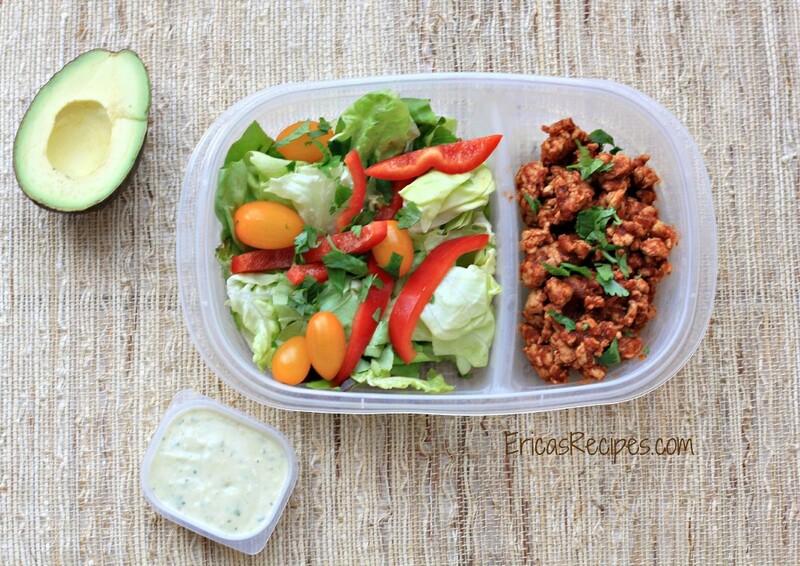 Divide the Avocado Herb Dressing (2 T per day), prepared taco meat, and veggies among 5 containers (or more of you don't have containers with compartments) so that they are kept separate from each other until ready to eat. I also store the salad dressing in the freezer to keep. Then just let the dressing thaw in the morning, give the taco meat a quick zap in the microwave, and toss it all together for lunch. Yields: 5 servings.